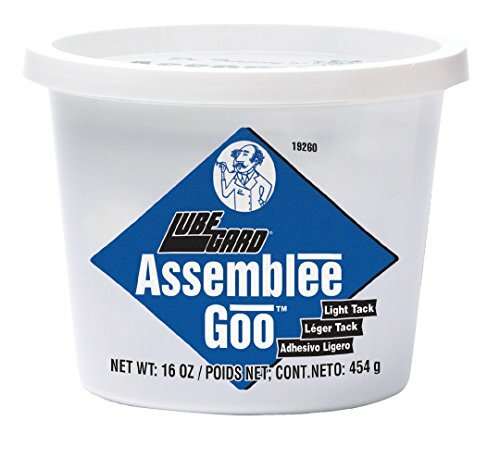 Assemblee Goo Blue Light Tack Lubricant is formulated for use as an assembly aid and lubricant for virtually any mechanical assembly application. It was originally developed for automotive technicians rebuilding engines and transmissions. The brand of products from the makers of Lubegard are considered to be rebuilding essentials for anyone working on cars, boats, trucks and bikes. The assemblee goo provides lubrication, but most importantly helps by holding components, like o-rings, seals, bearings, gaskets, sealing rings, bushings, and thrust washers in place with a firm, yet fluid-safe tacking agent. Compatible with all transmission fluids. No water/soapy residue to contaminate new automatic transmission fluid. Dyed blue to prevent misdiagnosing leaks. The assemblee goo light tack remains smooth and stable and will not melt at shop or work bench temperatures. It also comes in a firmer tack (green goo) for all types of assembly requirements. Both assemblee goo products dissolve and become soluble in fluids at normal operating temperatures without clogging filters or valves. assemblee goo is not harmful with prolonged skin contact and is safe around people, pets and plants. Effective up to 116 degrees Farenheit. If you have any questions about this product by Lubegard, contact us by completing and submitting the form below. If you are looking for a specif part number, please include it with your message. CRC Industries 06007 6-56 Multi-Purpose Marine Lubricant - 11oz.